We are pleased to announce the release of version 1.2.3 of our free iMedia Browser, a stand-alone utility that gives you fast access to your photo, video, music, and bookmarks libraries. This is a minor update, with the main feature being support for Aperture 3. We’ve fixed a few other issues, especially with how the application handles updating itself if you choose to access the iMedia window via a small icon in the menu bar rather than the dock. This will probably be the last update to iMedia 1.x. But don’t be sad — we are very close to releasing a completely new iMedia Browser, that will be tons faster and browse some interesting new sources of media. It will be freeware as well, and we’ll be sure to let you know when it’s ready. Many people with websites are completely unaware of the value of website meta information. It just sounds so blasted technical, doesn’t it? But, if you take a few moments to learn how it can greatly influence the number of “hits” to your website, you’ll be glad you overcame that hurdle. What exactly is meta information? These are elements within the construct of every web page that allow search engines to correctly categorize each page. Who cares? You do. Fortunately, Sandvox’s Page Details editor makes it easy for you to take advantage of these elements. The window title is simply the title of the page as it appears at the top of your browser window. More importantly, it is the top line you will see for each result when you search for a specific key phrase within a search engine. Each search engine displays it underlined and in blue. Which would you likely click on? If you are like most people, you would select the one that offers a compelling reason to click, even if it is lower on the results page. That brings us to the meta description. It defines the two lines beneath the title on each search engine page. It is in black type and runs to about 150 characters. Here you have a valuable opportunity to present an incentive to click — an attractive price, awards you have won, or whatever else would convert the site searcher into a site visitor. Not only will Sandvox allow you to freely alter those inputs, it also has a character-counter to let you know when you have exceeded the limit for each. By the way, you will want the title and description to be unique for every page. Like the title, any search terms used to find the page will be presented in bold-faced type. Do you think those search terms are an important component of window titles and meta descriptions? Absolutely. While it is possible to rank highly without using them in either the title or description tags, you definitely get positive points for incorporating the terms in each. Just remember, use the term only once, no more. Another misunderstanding occurs with keyword meta tag. This is not to be confused with the keywords or search phrases people use to initiate a search on an engine. Google no longer even indexes the meta keyword tag. While the keywords can sometimes be useful for other purposes, don’t worry about them for search engine optimization. Read about Sandvox’s “Page Details” editor, where you can enter metadata for your page. Those of you looking for a new, content rich design will love Behind The Rabbit’s newest creation. 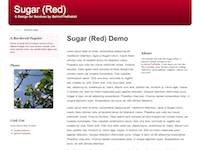 “Sugar” does a wonderful job of recreating the company’s own successful site, offering it in four colors: red, green, blue, and orange. Some designs are more conducive to blogging than others. Sugar makes it easy and effective. Whether you want text, a photo, a YouTube video, or any combination, it’s a snap with this clean and elegant design. The white background, rounded corners and shadowed photo boxes lend a subtle air of professionalism. There are 8 options for the header, and you can easily personalize them with your own graphics. Of course, your custom logo is supported, too. Sugar is bright, crisp and will certainly enhance your message. Price: $9.00. Check it out! One of the most interesting characteristics of the Internet is the ability to publicize esoteric and innovative ideas and companies. 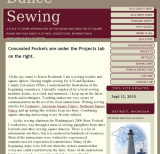 How else could Karen Reichardt possibly be expected to present instructions on how to sew the outfits for the 2012 National Square Dance Convention? With Sandvox “Expansion,” she has been able to provide unlimited updates to all of those looking for this very specific information for three years prior to the event! Roberto Franceschetti of Longwood Florida, together with Sandvox Pro, gives us another example of a well-developed, yet simple design that perfectly enhances the benefits of a single product we all could use. It has been estimated that a company employing 2000 people will spend $100,000 per year just dealing with spam. SpamFilter ISP addresses essentially one product and delivers the information in a cogent and compelling manner.